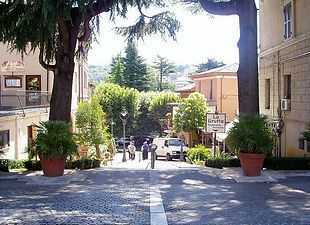 Two large rental apartments in Fiuggi, a delightful spa town South of Rome. Ideal for days trips to nearby Rome by train or bus, without the nightmare of driving or travelling in from Rome's outer suburbs. Pompeii is another popular trip although Fiuggi, also has its own wealth of cultural, Roman and natural treasures. 2 bedrooms - sleeps 4. 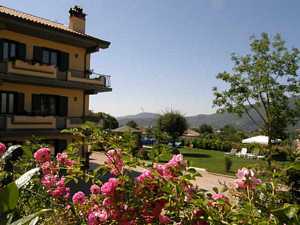 There are more details and pictures of the apartments lower down on this page so keep scrolling down to find out more about this delightful holiday destination. 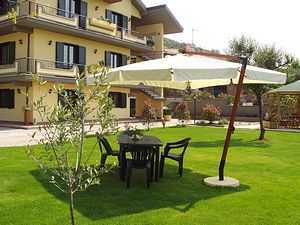 Our Fiuggi apartments in Italy between Rome and Naples are available for rent. 2019: Good availability - please enquire.. 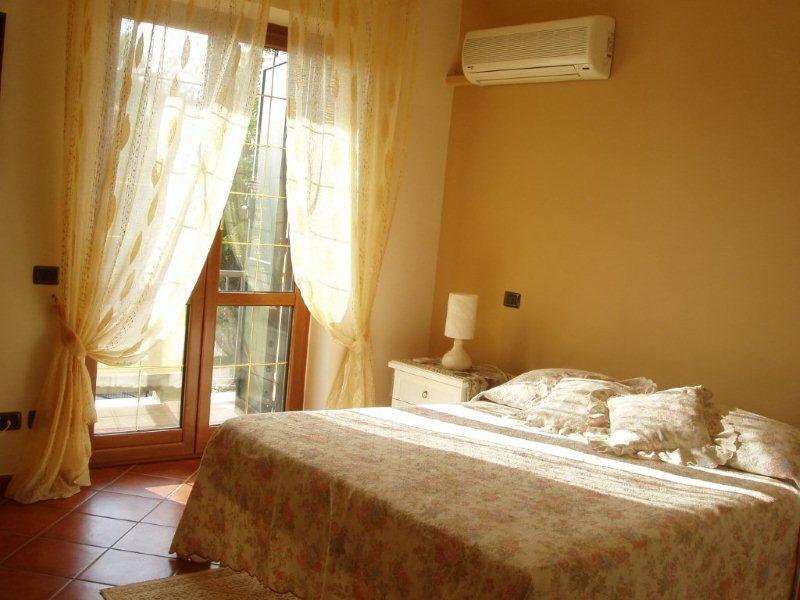 If your dates don't match, please scroll down for alternative accommodation in Rome. Please only enquiry if you have your own car or a rental car. 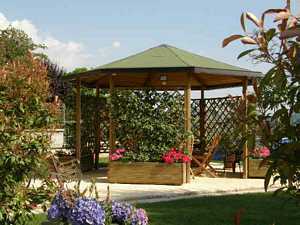 The apartments are set in beautiful private villa gardens. 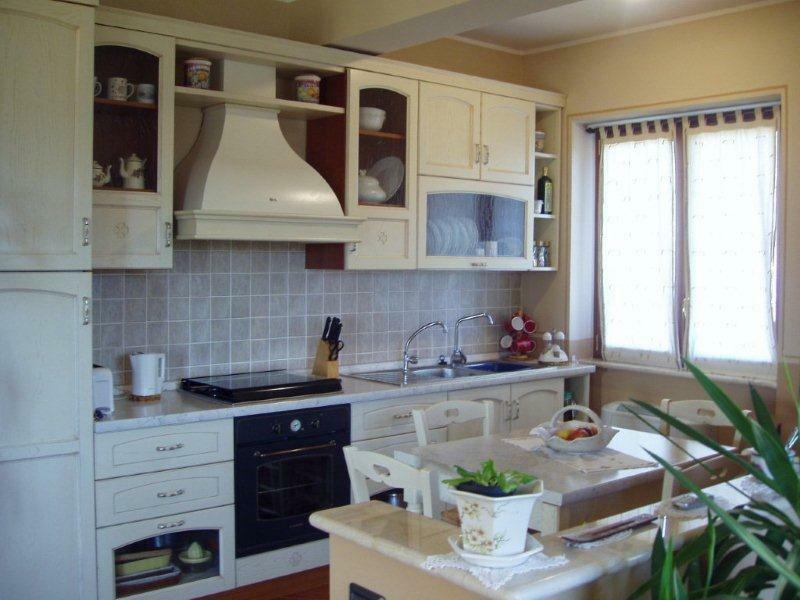 The two apartments can be rented together if you wish to enjoy a shared holiday in the Rome area with friends or relatives. 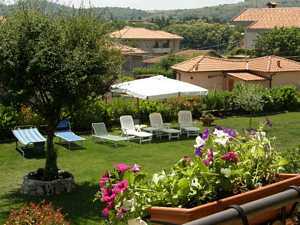 The first apartment is a large (110 sq meters) luxury apartment with balconies facing south and west with a magnificent view of the valley and the town below that has been decorated and furnished for use by members of the family. 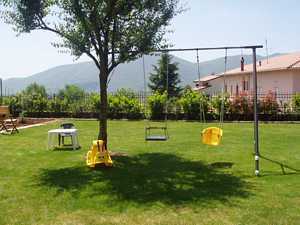 The second apartment is on the ground floor and is particularly suitable for families with children. 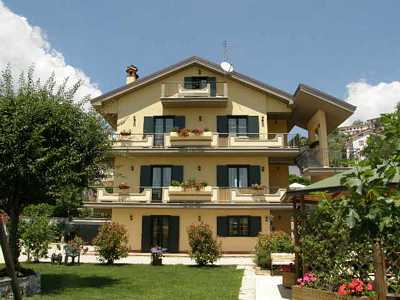 Located in a private villa in the residential zone of Fiuggi, the accommodation is newly built and is furnished to a high standard with double glazed windows and shutters the windows also have fly screens. 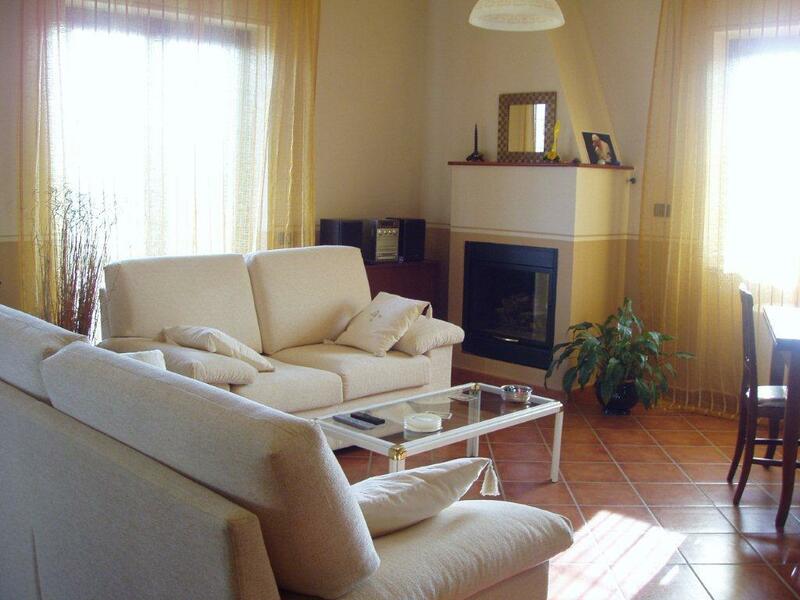 The apartment is bright and spacious, with french windows that open onto a balcony with view. 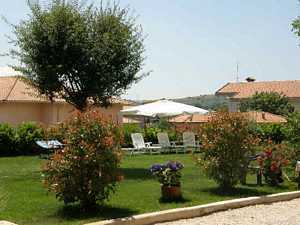 The apartment includes all facilities and equipment necessary for a comfortable stay. 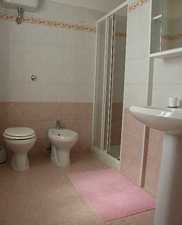 A washing machine, iron and ironing board are house in a separate utility room. 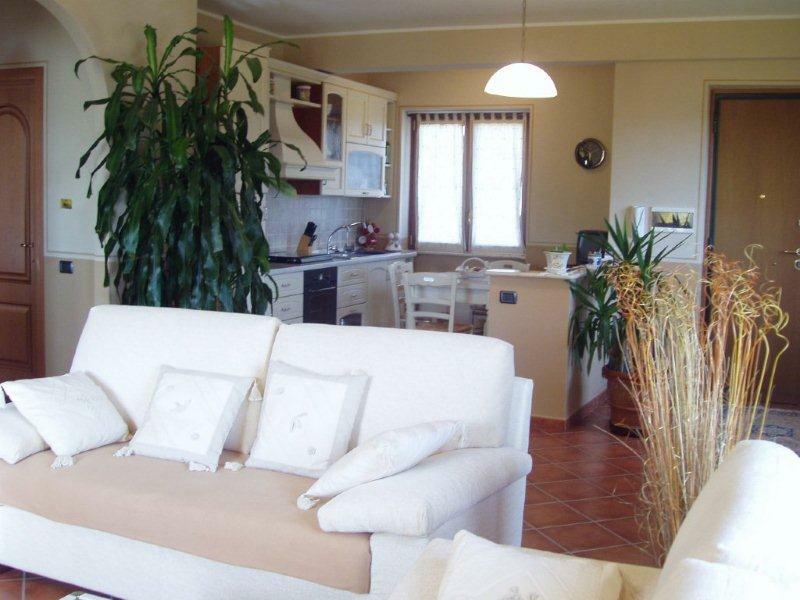 This apartment sleeps 4 in one large double bedroom and one large twin bedroom. 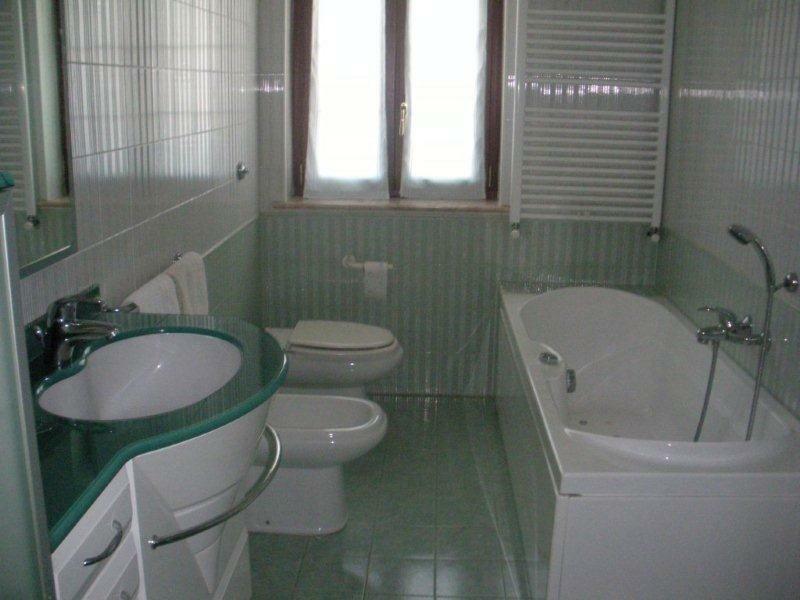 One bedroom has its own private bathroom and the other has use of the large main bathroom with Jacuzzi bath and shower box, both of which have quality fixtures and fittings. We just returned from a 3 week stay in Italy. 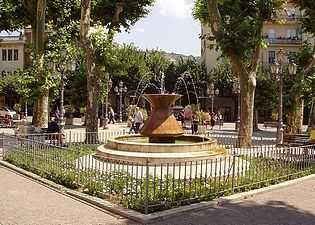 Our time in Fiuggi and the surrounding area was absolutely fantastic. 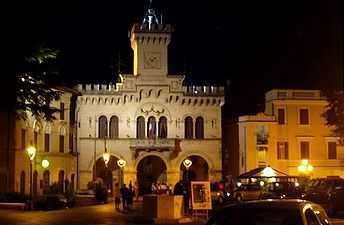 The Ciociaria area is beautiful (probably similar to Tuscany before tourists discovered it), and a convenient location. Close enough to experience Rome, but far enough to get away from the City. The apartment was perfect. There was plenty of space for the three of us, and Dorothy is a wonderful host. Their conversations, recommendations and fresh vegetables from their garden were a nice touch! 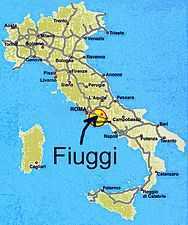 We stayed in Fiuggi for approx. 10 days in this apartment. We had a great time and this was in no small part to the quality of the accomodation and the warm welcome we received from our hosts. 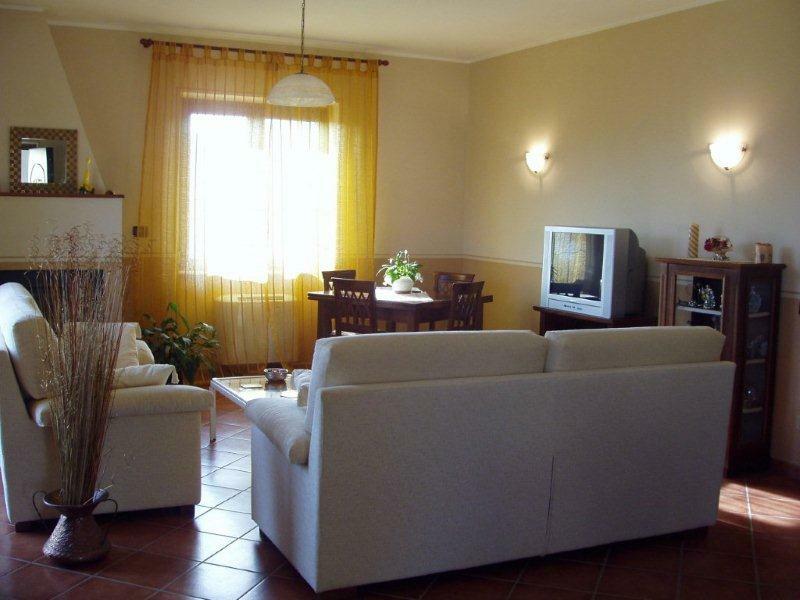 The apartment was very comfortable and close to walk to town. 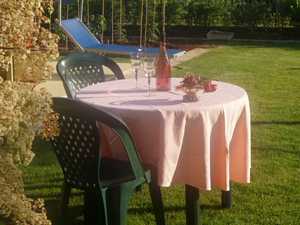 The garden was fantastic and it was really pleasant to relax in the afternoon. "We live on the premises and if guests wish to do their own thing, fair enough, they will rarely see us or hear us. If on the other hand they need advice on where to shop, where to eat, where to go and how to get there, what not to miss and also what to avoid, we can offer advice, maps, timetables, and what we don't know we can easily find out about." Local knowledge is the best way of getting the most from a holiday. Also, one of the owners is English, which is very comforting for those who need help with a translation, or who have simply been perplexed by an Italian word or phrase. 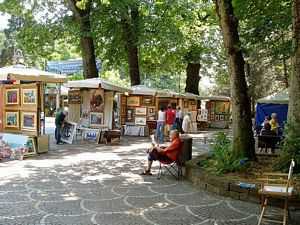 Proximity to Rome is a bonus for visitors to Fiuggi, with its higher altitude and shaded squares affording respite from the Summer heat. Naples is to the South and visitors can enjoy walks in the beautiful countryside or day trips to towns, including Cassino with its War Memorial Cemetery, the hill-top Abbey at Montecassino, monasteries and historic churches. 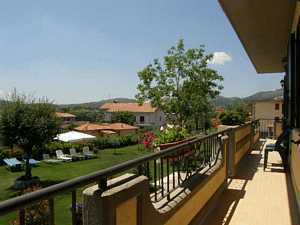 The Ciociaria region of Italy to the South of Rome and North of Naples offers the visitor a wide variety of cultural exploration and discovery, form the beautiful landscapes, to Roman remains, medieval churches, famous monasteries, food and wine, beautiful towns and of course the spa town of Fiuggi where this vacation apartment is located. 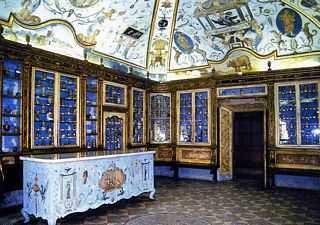 "Some friends staying in Rome came to visit, they thought Fiuggi was wonderful as they had tired of Rome after 4 days. We took them to the beach at Terracina (one hours drive away) and afterwards for lunch at San Felice Circeo (Maga Circe, Odyssey, Ulysses) and were back home in the evening to the cooler climate of Fiuggi where a bottle of local wine and a barbeque rounded off the day perfectly. Rather than go back to Rome the following day as planned, the drove into the mountains to Campo Catino, which is a ski resort during the winter (30/ to 40 minutes away). Everyone thinks first of Rome, but those lucky enough to discover Fiuggi find that they can see the sights of Rome and Pompeii and also have a proper Italian holiday at the same time." 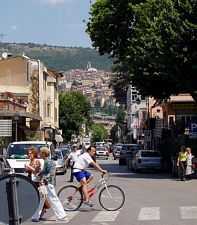 Fiuggi is divided into two communities. Fiuggi Citta is the old town that dates back to medieval times and Fiuggi Fonte is the new town that is built around the Spa and hotels. There are numerous restaurants and pizzerias in both the old and new towns and bars with live music play in the evenings during the warmer seasons. 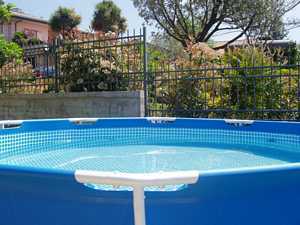 OUTDOOR OLYMPIC SWIMMING POOL: in Fiuggi. 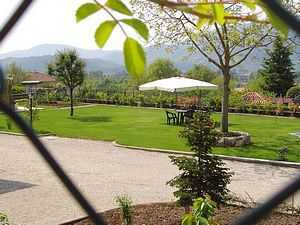 GOLF COURSE:18 holes, club house, restaurant, bar, tennis courts, swimming pool. GYMS: two private gyms provide modern work-out facilities for those who don't want the local cuisine to get the better of them on holiday. HORSE RIDING: horses can be hired by the hour at the local stable, and offers a wonderful way of exploring the region. Fiuggi has a large shopping centre and plenty of supermarkets, with a local market on Thursdays and a daily fruit and veg. market. The spa is centred on Fiuggi's waters that have been known for their therapeutic properties since before the Middle Ages, with the healing powers of the water noted by Pope Boniface VIII as well as Michelangelo. Today, the spa is located in Fiuggi Fonte and comprises a modern treatment centre and accompanying spa facilities. Treatments include inhalation of the sulphur-calcium bicarbonate waters, saunas mud-wraps, and many more. 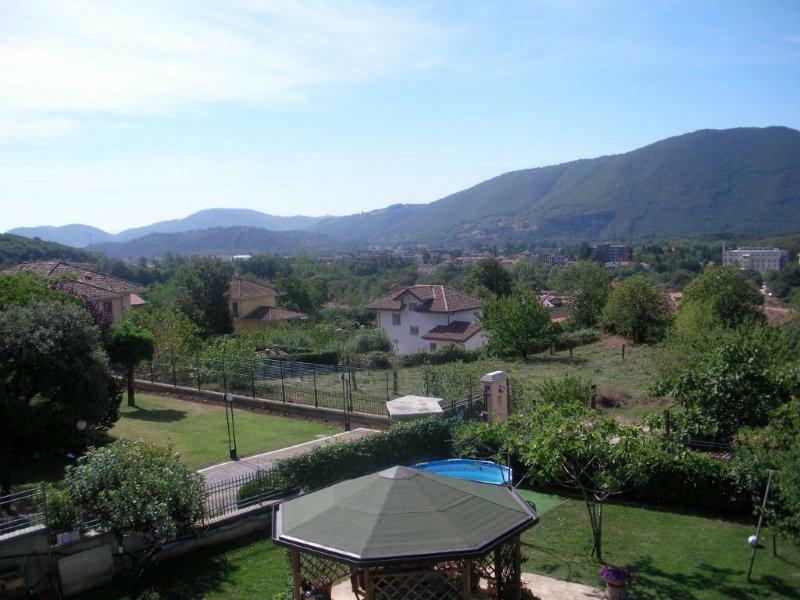 The newly invigorated and restored visitor can enjoy a round of golf at the nearby Fiuggi Golf Club or take some gentle exercise exploring the many caves and lakes, the impressive waterfall on the river Liri, the Aurunci Mounts Nature Park or the National Park of Abruzzi, Latium and Molise. Of course, an alternative is to head straight to a restaurant and sample the delights of the local cuisine accompanied by the excellent Cesanese del Piglio local wine. 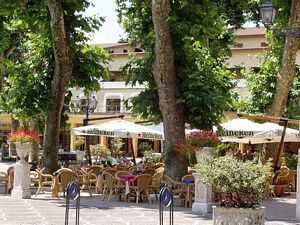 BONIFACIO SPA: where people go to drink the waters, situated in a wood of chestnut trees. 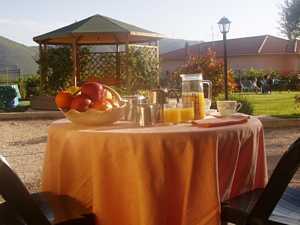 Entertainment includes live music in the morning with typical Italian songs. O sole mio. Volare, etc. ANTICOLANA SPA: popular in the afternoon. Again you drink the waters in a park environment with live music and dancing; waltz, tango, quickstep, a bit of line dancing and Latin American. In addition to the music there are tennis courts, crazy golf, bowling, children's playground, bar, theatre, and a train suitable of Children which runs around the park. 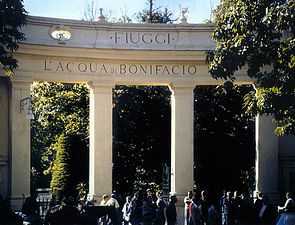 Fiuggi has been famous for its waters for 100’s of years. They are noted to be particularly effective for the treatment of kidney stones. After taking the waters for 10 days under doctors prescription, most people pass the stones, thereby avoiding surgery. Many other treatments and cures have been introduced at the spa over the years, but the simply allure of the curative waters remain the prime attraction. "WITH FIUGGI WATER YOU WILL FEEL 10 YEARS YOUNGER"
The birg ticket for the bus or train return journey to Rome INCLUDES all public transport in Rome (Bus and metro / underground) and costs just 9 euro. Many apartments advertised as 'City Centre' actually entail a journey of almost an hour, first walking to a metro then enduring a hot and stuffy ride into the city. 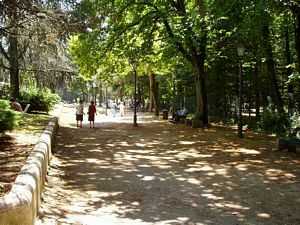 Travelling into Rome from Fiuggi is a much better idea. The journey by bus or train takes an hour, and you are soon able to enjoy this most wonderful of capital cities, but what a joy to be able to escape back to Fiuggi at the end of a hectic day, to the pure air and cooler temperatures that this higher altitude affords. A local Fiuggi travel agent runs coaches daily to various places of interest including Naples, Cassino, Capri, Tivoli Falls, Frascati, Subiaco and the Roman Lakes to name but a few. A visit to Pompeii is high on most people's agenda when visiting the region, and by choosing Fiuggi as your based, you are not only well placed for easy visits into Rome, but being to the South, your are spared the long journey to Pompeii that has to be endured by those who stay in and to the North of Rome. Located Southeast of Naples, Pompeii is an education experience for children and a joy for adults with an interest in Roman history that this volcano in 79 AD so catastrophically preserved. 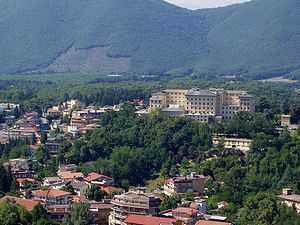 An essential visit for most people, particularly veterans and their families visiting the Ciociaria region of Italy, is Cassino. The centre was razed by allied bombardments during the Italian campaign of the second world war, as attempts were made to draw German troops form the Russian front and France. The German defensive position along the Gustav line was strong and their placements in Cassino and on hill-top with its controlling vantage point, presented stubborn resistance. The controversial decision was taken to bombard the ancient Abbey of Montecassino and Cassino finally fell on May 18th, 1944. Devastation of the ancient abbey was almost total, but it has since been reconstructed stone for stone. The Cassino Memorial War Cemetery commemorates more than 4,200 servicemen who fell during the action. 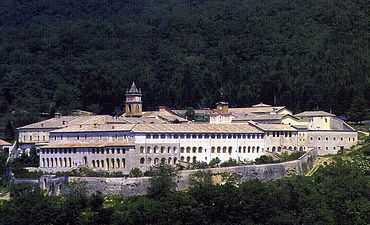 The abbey of Montecassino dominates the surrounding landscape form its vantage point on Mont Cassino. 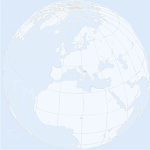 Famous for the destruction it suffered in 1944, it also faced earlier sacking in 1349, 883 and as far back as 581. Yet today it stands complete and ornate, as a testament to the Benedict monks who founded the Abbey in 529. 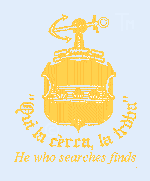 The Cassino monks were renowned for medicine, astronomy, law and philosophy, as well as for music and its library, which contains the first legal paper written in Italian, rather than Latin or Greek. Of the three entrance portals, only one is original, with 12th century Byzantine inscriptions. 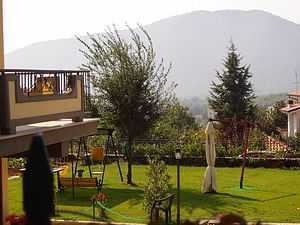 At the higher altitude of 800m stands the Carthusian monastery of Charterhouse of Trisulti. This monastic settlement is now a national monument. 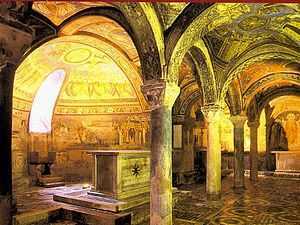 The church walls are adorned with painting by Balbi and Battelli and the fresco in the vault is by Caci. The Cistercians Abbey of Casamari, Anagni's Cathedral and numerous churches are all to be found in the Ciociaria region. 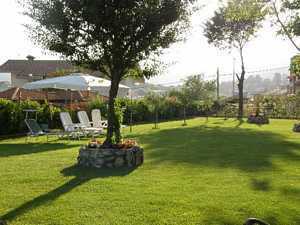 The owners cultivate a vegetable garden and are more than happy to offer seasonal produce if any visitors wishes to do a little cooking during their stay at the apartment.